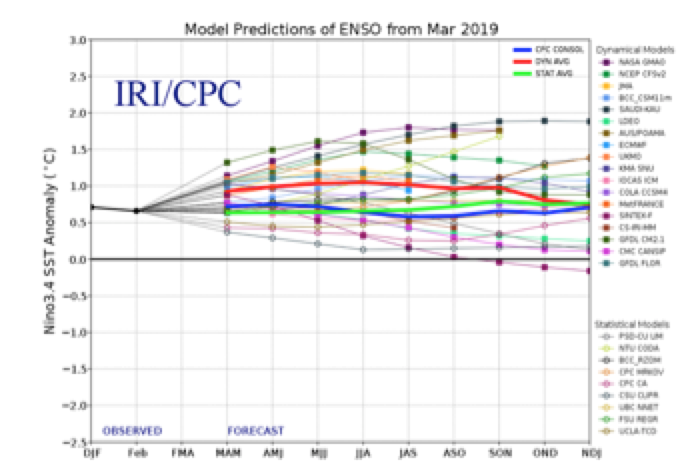 2019 ENSO forecast | Watts Up With That? Is the forecasted El Niño for this year fading away? It sure looks that way. Typo in Figure 1. explanation. Should say anomalies (>0 C) highlighted in red, not (<0 C). 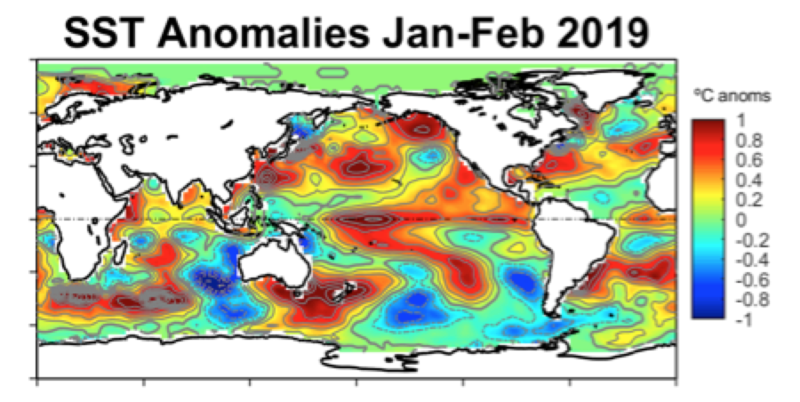 So, it doesn’t look like we can predict ENSO oscillations even a year out very well. What was that about settled science? Without understanding the cause any prediction has no value. When we know more about the cycles of the equatorial Pacific’s tectonic activity, the science might have chance to get there. I definitely cannot agree with your opening statement. Any reliable prediction has value when it comes to the weather. Any engineering prediction that gives a three nines answer is useful and one and a half nines was used for decades. The “rules of thumb” used in the first century of the industrial age were giving useful answers even when the properties of materials were substantially unknown. Consider the difference between a simplified deflection formula that gave an answer within 2 or 3% of the real value, and the hopeless climate models which, the modellers claim, are based on well-understood mechanisms. All that “science” stuff they go on about. If the understanding is so good why are the results so bad? At the least we have to characterise sets of systems and their relative ability to give a “right answer”. I have followed many of your detailed explanations and am impressed with your ability to get a ” pretty good answer” with no clear idea about the underlying mechanisms. Nothing wrong with that! It is sort of like being able to sing beautifully and not being able to read music. I don’t care, only listen and applaud. Well that El Nino didn’t really get going at all. Would love to know if this is linked to the solar minimum? I wouldn’t write it off yet. The plot of Nino 3.4 shown here ends in February. It rose 0.3°C in March. Global temperatures rose 0.2°C, and April so far is even warmer. The solar minimum indicates there should be a Niño at this time, as I predicted last July. 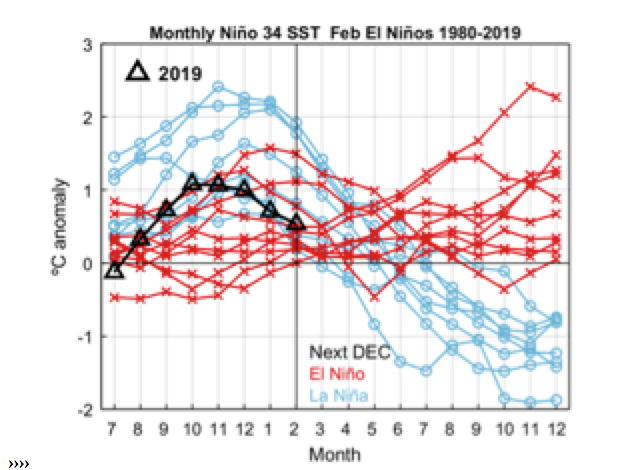 The strength of the Niño likely depends on the conditions, the amount of subsurface heat accumulated at the time it starts, how long since a strong El Niño, how long since a strong La Niña. ENSO is a capacitator that recharges heat during Neutral and La Niña conditions and discharges it during Niños. 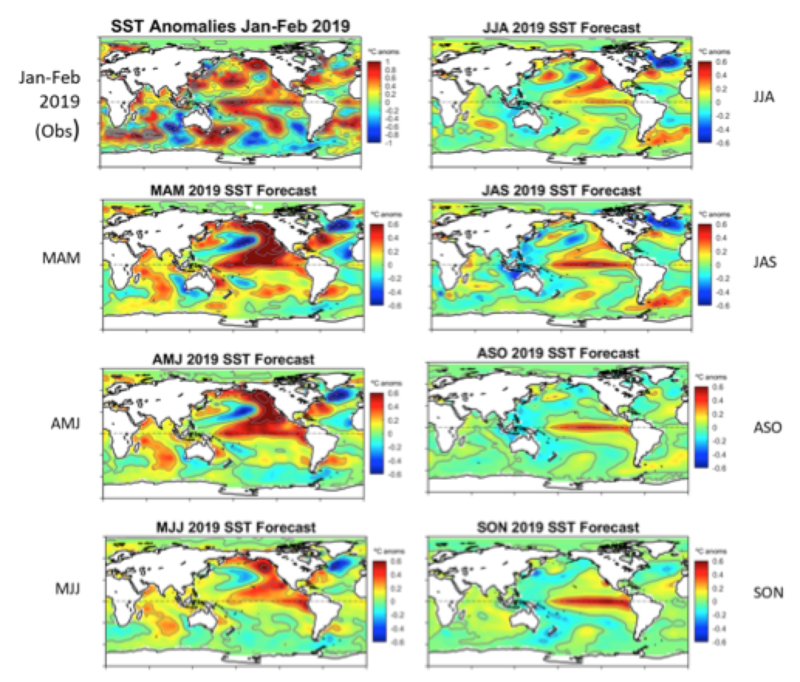 A La Niña is expected in late 2020-2021 and conditions suggest it could be a two-year Niña. So if we go by their past accuracy in forecasting ENSO, then this forecast means it will either be a strong El Nino or a strong La Nina !!!! About 3 weeks ago some anomalously cool water started to upwell near Central America and has subsequently grown larger. 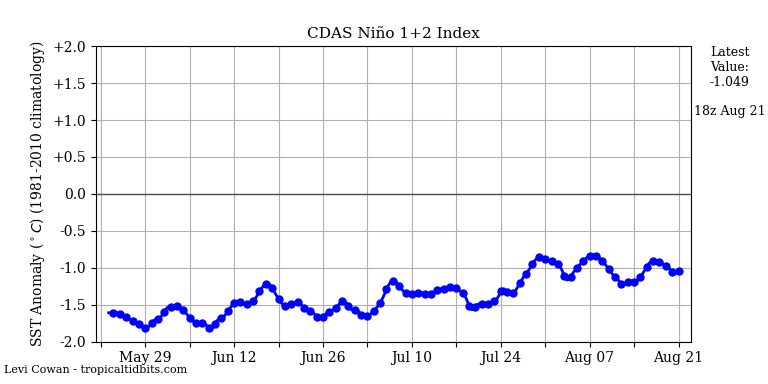 It already appears to be cooling the Nino 3 region and the tradewinds are back to being strong. Yeah, I’ve seen that — quite odd. If you looked at the below site it showed strong north to northeast winds right in those cool spots, so presumably those winds caused extensive upwelling of the cool water there. Nino1.2 does tend to be the starting point, though Nino3.4 seems to be the reference for supposed lagged- correlation with other parts of the world. 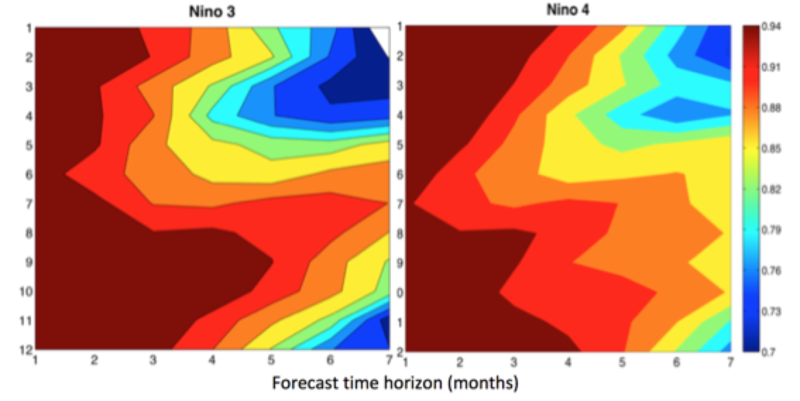 Anyone looking to forecast should probably be studying Nino1 and 2. Yes Robert, this looks like it could be very interesting. This cool water is mixing with the upwelling warm water and starting to produce neutral conditions. If this keeps up then I expect to see an ENSO neutral summer. 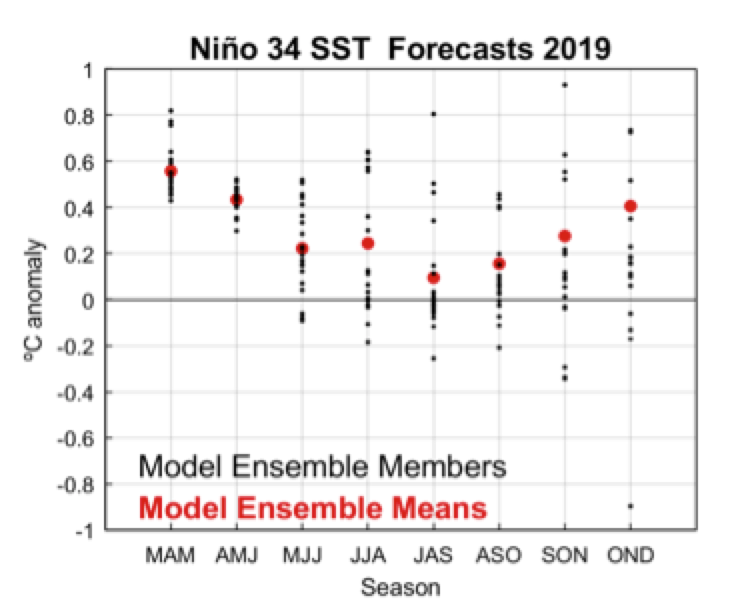 Looking at figure 2, we can say with complete confidence that the Nino 3.4 sea surface temperatures will be going down for the rest of the year…or up…or stay the same. Actually, the only thing we can say with scientific confidence is that we have very little confidence in our ability to predict ENSO conditions very far in advance. Of course, it is important to make forecasts in order to test our ideas about ENSO, and gradually improve our scientific understanding. It would just be foolish to be implementing sweeping policy changes based on forecasts that have shown very little skill. My bet is that temperatures wiil be bang on long term averages. Wiggle watching… with very little wiggling. This makes oil price forecasting look good. 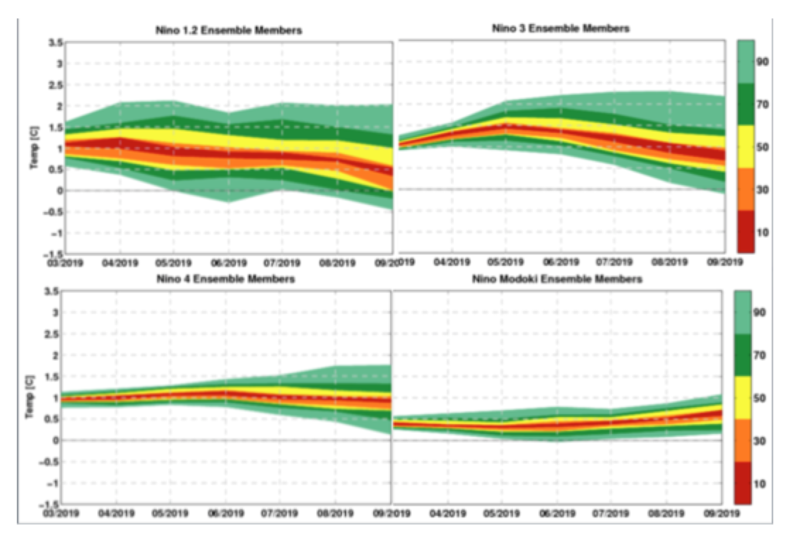 ENSO neutral conditions in the fall will increase the Atlantic Basin Hurricane numbers/intensity over the current forecast of slightly below normal 2019 hurricane season. This seems to be associated with the formation of a surface wind current through the middle of the pacific! From an antarctic low via a central pacific high and over Tahiti and from there over the western equatorial pacific. This may be nothing more than coincidence but I haven’t thought to look at this area of the pacific before for changes in ENSO. I will be watching this area more carefully in the future. The SOI is based on the atmospheric pressure comparison between Tahiti and Darwin. That is what drives strength and direction of the trade winds. Does that help out? Hi Pop Piasa,I’m know what the SOI is, also Kelvin waves, counter currents, reversal of trades in the west pacific, ocean height anomalies etc. I didn’t realise the possibility that the strenght of the trades in the western pacific could (maybe) be directly affected by antarctic pressures via the central Pacific route- I had assumed this occured up the western coast of South America. 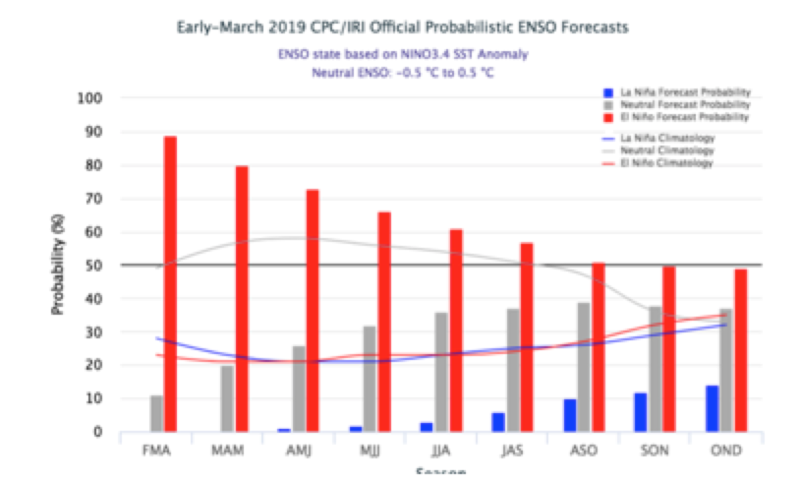 When the ENSO forecast made by the Japanese Met Agency moves 50 % El Nino vs. 50 % neutral, then I will start to think about this actual El Nino starting to weaken. But not before. Simply because I watch this page since quite a long time, and JMA’s predictions were all the time the best ones. I like this analog prediction. An interesting document. I appreciated. Someone should tell them that there is no such thing as Seasonal Climate Forecast. If one is forecasting the next season, one is forecasting weather, not climate. (1) Last Oct, ‘We are closer to both the solar and ENSO 2006 analog year.’ ENSO & analog years. Pacific Ocean Equatorial anomaly for this year is encouraging evidence for (2) LaNina-ish development. 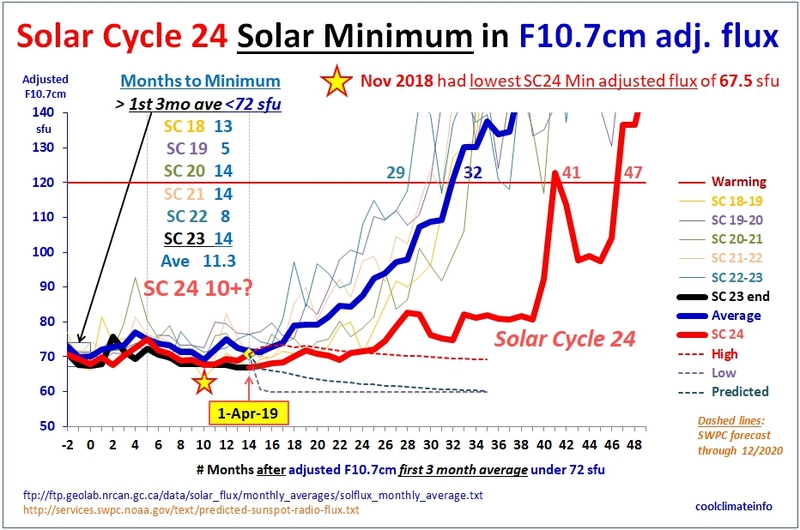 If SC24 hasn’t already reached it’s minimum, this month will break the SC18-23 solar minimum 5-14 month window (see prior image) for duration to the minimum after the first 3-month average of adjusted F10.7cm under 72 sfu. 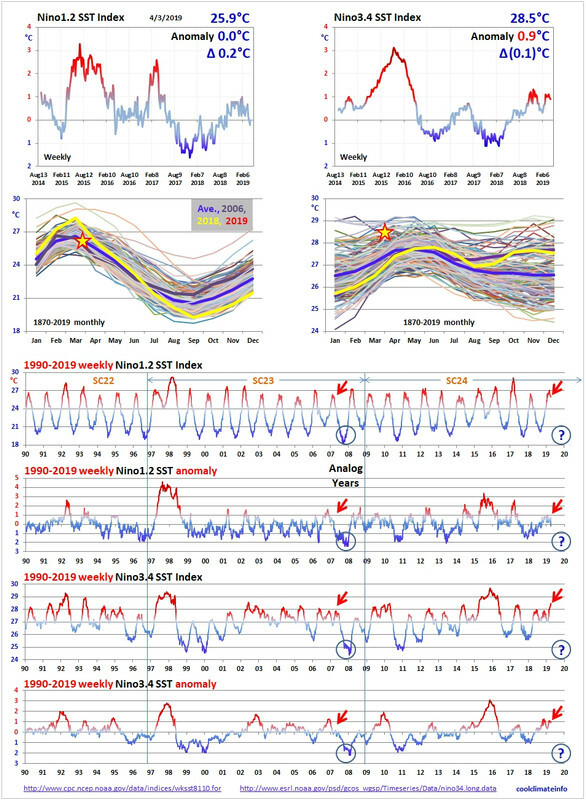 So solar cycle 24 could in theory last another 9-13 months, which would put my expected solar cycle onset ENSO into the 2020 time frame instead of 2019, while also preserving previous ENSO patterns. No matter what it’s going to be interesting, and hopefully as clear-cut as the last minimum. 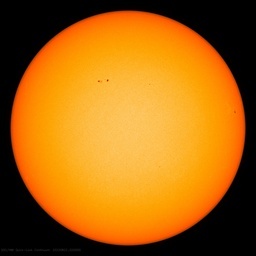 Even though this solar cycle was historically low early, currently at 124 months long it still hasn’t reached the average length of the 24 counted cycles, 132, and is low on the ranks of length, with 15 cycles above it that averaged 140 months, 164 max.